The one thing that’ll definitely bring toxicity in your life is a DIVORCED HEART. Today I show you how to start your Divorce Detox. First, we start with what a DIVORCED HEART really is, and the devastating effects it can have in your life. Remember that time isn’t money…it’s your life. The emotional and financial loss is devastating, and destructively TOXIC. It can takes YEARS to recover. In fact, some dear souls never do. I was there too…caught up in a holding pattern of self-destruct, self-doubt, and almost complete loss of my SELF. I desired to lift my head up, and see something that would inspire me to get up and GO UP. I desired to be FREE. I desired MORE than a recovery. I desired to rest and restore. I desired to live without MORE, but to explore the TRUE nature and DESIRES of my heart and soul within my core. To (wo)mance and love her. To fully engage with her. To reconnect and live from my heart and soul. To FREE HER to BE the fullest expression of SHE. I desired a NEW kind of LOVE. A powerful relationship WITH ME + MY LIFE. What would it look and feel like to truly LOVE + CARE for ME? What was I looking for, really? I was looking for the truth. I googled, SELF LOVE…nope, that wasn’t the truth. I googled DESIRE…nope, that wasn’t it either. And it took me not to the outside for the answers, but inside. Deep within my heart and soul. I began to appreciate HER for who she was, is, and will be. I began to give HER my undivided attention, no longer lost between the chasm of my head and heart…but directly in the CENTER of my soul. 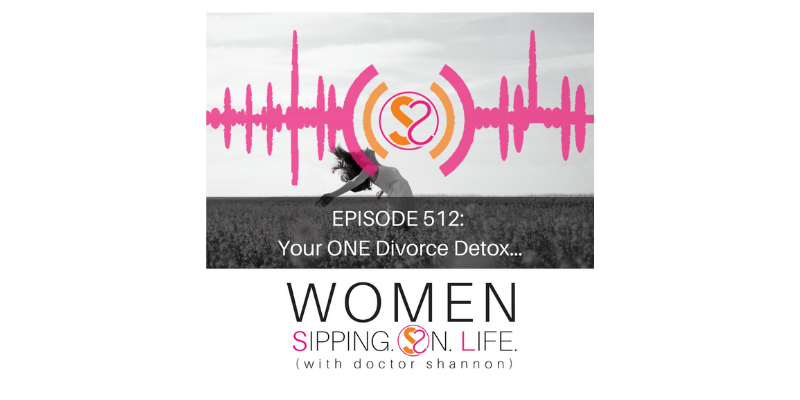 Let’s talk about 2 powerful processes of DETOXING from a DIVORCED HEART. It’s difficult to become CLEAR when we’re NOT “here”…in the present of the now. Get present with your pain, past, and present. The cleansing begins with a CLEAN SING. To sing a NEW SONG. Grabbing hold of the “NEW” that you FIND. Are you CLEAR about what this is for you? I lived in the TOXIC BOX of fear, hiding, and holding back for over a decade, until I discovered SACRED S.O.L.UTIONS for accelerated healing, and awakening HOPE for true love and life. 2. Are you willing to “redefine” that for yourself right here and now? 3. What is it? (Your “redefinition.”) What, from this day forward, are you going to choose call yourself? Your situation? Commit to no longer allowing your situation or circumstances to identify you. Redefine who you are today, and begin to cleanse and clarify your life…TODAY.